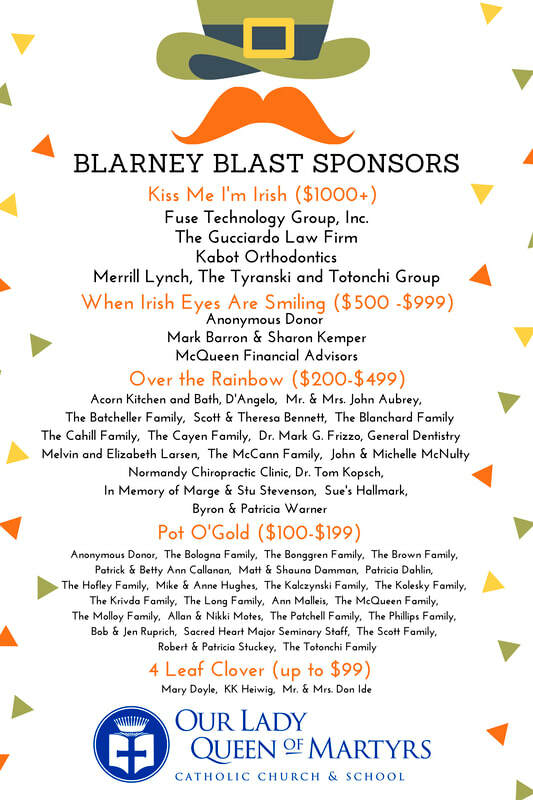 Our Lady Queen of Martyrs Catholic Church & School – THANK YOU for supporting BLARNEY Blast! Thank you to our Blarney Blast Team: A heartfelt thank you for lending your time and talent even when that meant sacrificing family time! Special thank you to Daniella Brown for leading Blarney and the entire team: Danielle and Andrew Agbay, Suzanne Bologna, Kevin Brown, Chrysanthe Buschmohle, Jen Byrne, Amy Dobski, Jen Forgach-Gross, Rox Gatia, Amy Totonchi, Angela Kalczynski, Tom Kenez, Allison Kolesky, Gina Krivda, Carolyn McQueen, Sara Molloy, Michael O’Brien, Sean Patchell, Angela Rotter, Jen Ruprich, Lucia Saad, Colleen Scott. Thank you to our volunteers: For realizing that Blarney Blast cannot go on without volunteers and stepping up to help make it a success! Thank you to OLQM teachers and staff: For Colleen Everly, Susan Hamm and Sue Balok supporting all of the incoming mail and calls. Andrew D'Agastino and Jason Tackett for all their endless maintenance support as well as for the staff that came out and showed their support! Special thank you to Jeanie Bay for all of the tireless hours she contributed into our auction art! Thank you to those silent contributors: For donating their time, money or goods, and especially for those who silently did the work that needed to be done, even if there was no recognition for it! Thank you GOD: For all of Your blessings on OLQM and Blarney Blast 2019!